For many of us, a trip to one of the international markets in Memphis is almost like visiting a foreign country — the food labels are written in a different language, there's an array of produce we have never seen, and foreign smells and languages whir in the air. The newly opened Sara Supermercado on Park near Getwell is no exception in many ways, and yet it's different. With all the things hanging from the ceiling at Sara — Superman piñatas in the main grocery section, for example — it feels a little like you've stepped into a rather unusual birthday party. Sara is owned and operated by Nathan Hammab, who moved to Memphis from Chicago three years ago and quit the beauty-supply business in order to open the market. The business consists of two stores. One is the small market carrying mostly Hispanic foods; the other is a butcher shop (pictured below) with a counter that stretches the length of the shop. 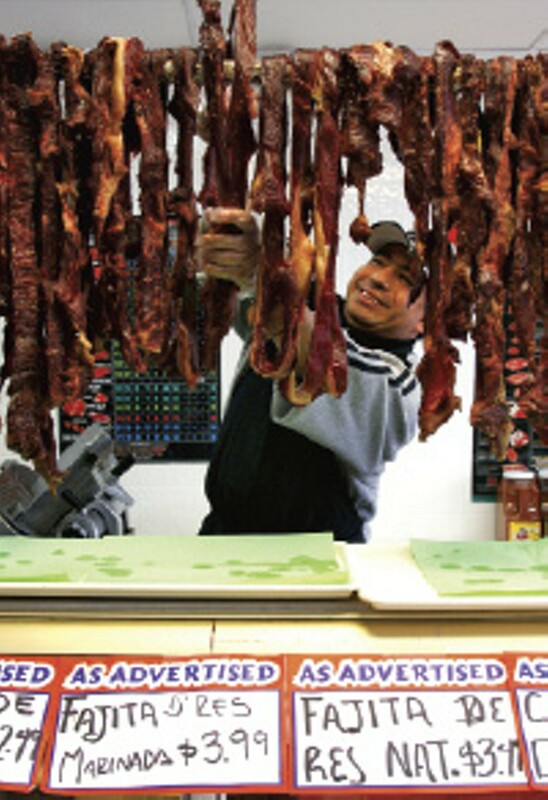 In the butcher shop, strips of cured beef for making jerky hang to dry above the counter. On display in the glass cases are marinated pork, beef, and chicken, skewered chicken, pork chops, several yards of sausages, and fresh seafood, among many, many other meats. Price and item descriptions are mostly in Spanish, displayed on bright orange tags strung from wall to wall. The butcher speaks very little English, but Hammab will help out if pointing to the desired item and hand signs don't get you anywhere. Store hours are Monday through Saturday 8 a.m. to 10 p.m. and 8 a.m. to 9 p.m. on Sunday. The Peabody hotel, which recently received the Mobil four-star award, will partner with Jack Daniel's for a Southern Dinner and Whiskey Tasting on Thursday, March 27th, at 6 p.m. The dinner is part of the 75th anniversary of the Peabody ducks, a tradition that started after a little too much whiskey. Lynne Tolley, one of the distillery's seven master tasters and owner of Miss Mary Bobo's Boarding House Restaurant in Lynchburg will lead the whiskey tasting of Jack Daniel's Old No. 7 Black Label, Gentleman Jack Rare Tennessee Whiskey, and Jack Daniel's Single Barrel at Capriccio Grill. The tasting will be followed by a four-course dinner featuring recipes adapted from Tolley's Cooking with Jack. On the menu: Tennessee-smoked trout spread; spinach and beet salad with bacon dressing; cornbread and muffin cup ham biscuits; glazed salmon; beef brisket; and bread pudding for dessert. Cost for the dinner is $85 per person plus tax and gratuity. Reservations can be made by calling Capriccio Grill at 529-4183. On Saturday, March 29th, Memphis in May is holding a barbecue-judging seminar on the judging process and the rules of the World Championship Barbecue Cooking Contest. Participants will learn about the official meat categories, the scoring process, and blind, on-site, and final judging, and, of course, sample barbecue during the simulated judging exercises. Attending the seminar, however, isn't sufficient to becoming a certified judge. That badge is obtained after judging an official meat category at two Memphis In May-style barbecue contests as well as completing other requirements. Cost for the seminar is $60 per person, and the registration deadline is March 21st. The event is being held from 8:30 a.m. to 4 p.m. at the Grand Ballroom of the Holiday Inn Select at 160 Union. For more info, e-mail cscott@memphisinmay.org or visit memphisinmay.org. In addition to its free cooking demonstrations on Tuesdays, Thursdays, and Saturdays, Williams-Sonoma now offers one-hour technique classes on Sundays at 11 a.m. The series will cover soufflés (March 9th), Easter eggs (March 16th), balsamic vinegar (March 30th), knife skills (April 6th), pasta from scratch (April 20th), breakfast for Mom (May 4th), and grilling 101 (May 18th). Classes are free of charge, but registration is required.